Since publishing the first season of Debt Collector, I’ve gotten a lot of questions about serials: writing, pricing, is it hard (yes), is it easy (no), etc. Hopefully this chapter will answer a lot of those questions and help you decide if serials might be for you or not. But keep this in mind: I looked around at what other people were doing and then decided to do things my own way. This is the essence of innovation and indie freedom – try stuff out! If it doesn’t work, try something new! I guarantee you’ll learn something in the process. The idea for my future-noir serial, Debt Collector, struck me out-of-the-blue mid-January. I cast other projects aside and started writing immediately (because I just. couldn’t. stop.). I ended up prewriting three episodes before I decide I actually had to publish this thing, it would be nine episodes in the first season, and it would be a complete story. I also decided to start publishing with only the three episodes pre-written, so I could have fan interaction as I went. Was this smart? It was certainly fun and hectic! And I know calmer heads probably would have pre-written the entire thing. But… I was anxious to share it with readers. I wanted to hear what they thought! It was just that kind of story. Hard to explain, but the fan interaction part was important to me. I ended up bundling episodes as I went – three at a time – and then bundling the entire season. I may not have had the entire season written, but before I published the first episode, I made sure I understood what serials were, what I was embarking on, and most importantly, what I was trying to accomplish with it, as a writer. I read serials. I thought about what makes a serial. I wrote about serials. Before I embarked on this journey, I had a myriad of questions: how many episodes? How often? How long/short should the stories be? How does this whole “episodic storytelling” work? And most importantly: does anyone actually read these things? People are actually very familiar with episodic storytelling via TV. We watch everything from self-contained series like Law and Order and House to broad-story-arc series like Lost or Heroes. Some like the week-by-week suspense of Must Watch TV; others would rather wait until the season is done and get it from netflix so they can watch it back-to-back. Ok, that’s TV. What about books? Ebook serials are a new thing, because ebooks are a new thing – but serials have been around since Charles Dickens wrote and released Great Expectations (self-published through his own literary magazine!) in 6k “installments” every week for nine months. Readers today aren’t accustomed to reading in serial format because publishing serials was restricted to magazines, which were missing two key factors: 1) wide circulation (most magazines don’t have it), and 2) a paying market (many ezines are free, and many paper magazines don’t pay much for content). Enter ebooks: low cost of transmission and access to a wide circulation. They’re a natural for shorter works. At first, authors dusted off their short stories or wrote new ones… and sometimes those thrived. But for the most part, readers raised on novels craved longer works and more in-depth stories… which made serialization the next natural step. How Long? How Many? How Often? Sounds like a smexy ad for… okay, we’re keeping this PG. Authors are experimenting like crazy with serialization in 2013. I’ve seen releases 1 week, 1 month, and 1 quarter apart. Number of episodes range from 5 to 15, length of episodes ranging from 6k to 40k. Forty thousand words! That’s… a novel, people. (Note: SFWA defines a novel as 40,000+ words, which is about 160 pages.) So you can see that experimentation is all over the map. I’m convinced none of that matters, with the slight caveat that the most successful serials to date have released every 1-3 weeks. Who Are The Successful Serials? Part of the eagerness to experiment with serials is no doubt attributable to the success of Hugh Howey’s Wool – a serial that propelled him to rockstar status. Unforunately, people once again are getting causality backward with his success with that serial. Wool wasn’t a success because it was a serial; the story was serialized because it was a success. Hugh wrote the first episode as a stand alone short story. It was so wildly popular, that fans demanded more. And he wrote more, releasing more of the story to keep up with fan demand. The episodes grew progressively longer (the first is 50 pages; the last 250 pages). Wool came out as a serial because fans demanded it and Hugh gave them what they wanted. In the process, he proved that people were willing to read serialized fiction – in spite of the unfamiliar form – for a story they loved. So, let’s look at a few popular serials. Hugh Howey’s serial started as a short story, but he listened to reader demand and wrote more. 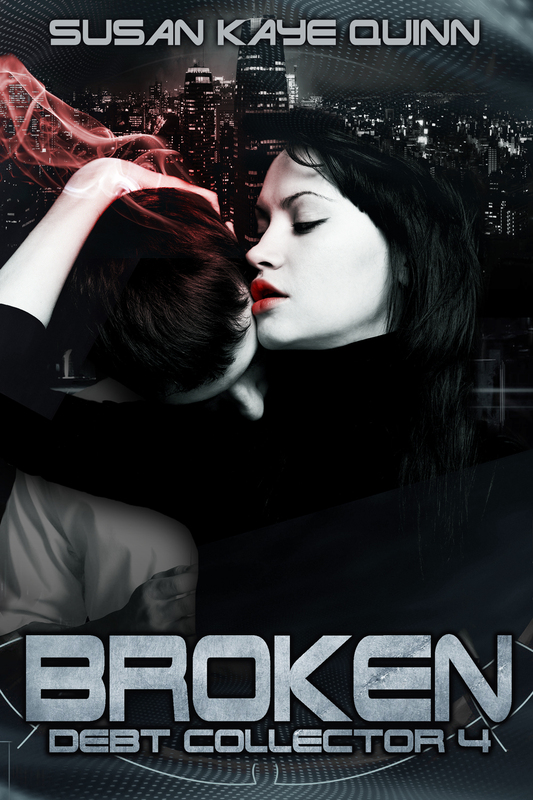 RaShelle’s Fairy-Tale-Turned-Vampire stories brilliantly captured the wave of demand for both those genres. Platt and Wright’s post-apoc tale does the same. But all are successful because readers were drawn into the story, not because the format has some special pixie dust that made them successful. The only caveat is that readers can sample a series by trying the first episode or two – if they’re hooked, they keep coming back. But as authors, this cuts both ways – readers can also stop buying the next installment at any time. Once again: it’s all about story. If readers like it, they will return. Which is why serialization is not the easy way out (see below). Can I Sell My Novel In Pieces And Make More Money? A serial is not a chopped up novel, just like a TV episode is not a chopped up movie. It’s a different way of telling stories. In a way, it’s more demanding than novels – you need to immediately draw the reader in, you have to reach some kind of reader-satisfaction-level by the end of the episode (even if you have a cliff-hanger), and you have to maintain that pace and storytelling arc over multiple episodes. You can pre-write all your episodes (and some people do), but the successful authors above all wrote-as-they-went, listening to reader feedback along the way. Serials are the Advanced Ninjitsu of storytelling. Serials are not the way to make easy money. Serials are not a short-cut to getting your work out. Serials are a new, exciting way to bring readers closer into the storytelling process and engage them in the creative process. It’s the hardest, best, and most fun writing I’ve ever done. Remember how repeating something over and over trains your intuition (see Training Your Intuition)? Writing nine tightly-plotting, fast-paced serial episodes that had to each contain their own story arcs, plus story arcs over the three-episode sets, plus story arcs over the entire season? That was some serious intuition training. Writing that serial definitely took my storytelling skills to another level. Novelists (and readers) already know there is a rhythm to stories. 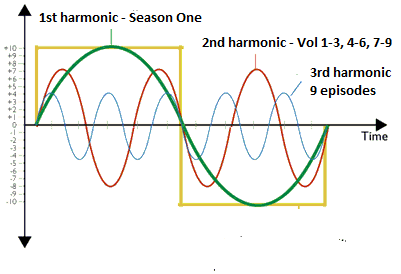 Serial writing formalizes that rhythm by breaking it down into discrete cycles of story – at the chapter level, the episode level, and then larger sets of episodes (3 or 5 or 9 or whatever, depending on how the story is grouped). In a novel, this is seen as story structure, or possibly subplots and layers of story. Exercising my writing muscles with the more demanding structure of serials has built up my intuitive grasp of this rhythm even more than before. In a longer narrative structure like a novel, there’s a tendency to go soft in the middle. There is some logic to this – the reader is hooked (hopefully) by your strong opening chapters, so you have room to glide a little, fill out some backstory, take a detour, smell the figurative flowers for a while. Yeah, there will be none of that in a serial. There’s no room for it – you’ve got a mere five (or seven) chapters to tell an entire story (or at least this sub-harmonic of the story), so you can’t waste time with stuff that isn’t relevant to moving the story forward. First chapters in a novel are important because they must serve triple duty: introducing characters, building world, and setting stakes. In my Debt Collector serial, I have nine first chapters. I’m introducing new characters all the time. Stakes are constantly being raised and resolved, somewhere along the harmonic spectrum. I quickly learned that every chapter has to be a first chapter: serving triple duty and wasting no time in moving the story forward. Similarly I have nine last chapters, ones that need to leave the reader breathless enough that they’re willing to fork out money again to get the next episode. Because the story is fragmented in a serial – the reader has to potentially make nine purchase decisions to get the complete Season One (or they can buy the box sets; or wait until the season is done; LOTS OF DECISIONS!). All this means is they have to decide NINE TIMES whether they want to keep reading the story – I have to earn reader loyalty again and again. There are cheap ways to do this, such as cliffhangers that are there for dramatic purposes only, trying to force the reader to read on to find out what happens. Although there are dramatic turns at the end of my episodes, I was determined to earn reader loyalty not with gimmicks but with character conflicts and worldbuilding that latched onto the reader’s mind and refused to let go. I want my readers to want to read on because they’re in love with the characters and the story. I have to earn this with every episode, something that can easily translate to novels: after all, a reader can decide at any point in a novel to stop reading as well. I can’t just set up the story once and trust the reader will stay along for the ride. I have to earn that readership with every chapter. Serial writing is fast, exciting, and a fantastic way to sharpen your writing daggers, er, pens. I wrote the first three episodes before I launched the series, then wrote as I went. Mostly the pace was “write crazy fast,” driven by the episode release schedule of every two weeks. Once the first draft of an episode was done, I did a quick second draft, then sent it off to my three critique partners. As soon as that episode was off, I started writing the next one. My crit partners were wicked fast in turning the eps around – I seriously couldn’t have done this without them. Once I had their feedback, I revised. For the most part, revisions went quickly. Then I read through once more out-loud for line editing, formatted and read the episode on my kindle for proofing, and it was time to upload. Episodes took from a week to three weeks to draft, depending on my level of discipline. Overall, it was 125k over nine episodes in about 4 months (my fastest prior pace being about 85k in 5 months). I was writing constantly. I had a great partner in creating cover art with Steven Novak. The first thing I wrestled with was the general “brand” or “look” to the series: dark, gritty, future-noir. I actually struggled for some time before I came up with a concept that I liked, namely black-and-white photos branded with fonts and background. Then I spent a ton of time trolling stock-art sites looking for just the right images. Finally, I decided that quality covers pay for themselves (see Creating Covers That Sell), and brought Steven on board to make the covers awesome (he did the covers for fellow Indelible RaShelle Workman’s 12 part serial, so I knew he could execute on it). He totally “got” my concept, and making covers with him was a dream. But it was time-intensive. Writing the serials at the pace I set was challenging enough; I underestimated how much time I would spend creating covers and formatting and uploading as well (even though I had done these things before). I could have outsourced the formatting part, but that would have slowed things down, so in the end, I think the process worked well. But it was intense. Once I had written the first three episodes, I had a general plot direction for the series. But I also left lots of room for pantsing my way through – partly because I wanted to listen to reader feedback and have the chance to incorporate it (which I did on several occasions), and partly because I was still discovering the world as I wrote the series. One of my favorite characters (Valac), I didn’t plan on having at all until he showed up on the pages. His story arc drove much of Episodes 4-6. I wasn’t completely certain about the story arc of Episodes 7-9 until Episode 6 was written. So, I mostly pantsed my way through. However, this isn’t my first time at the rodeo – I’ve written several books, including a complete trilogy – so I have a pretty firm grasp on the rhythm of a story that will (hopefully) be satisfying to the reader. Do you find your readers are more engaged with your serial than your novels? This is hard to tell – with a serial, I get feedback along the way. The equivalent would be if readers of my novels stopped every few chapters and said, “This is my favorite chapter so far!” I’ve actually had a few readers who will tweet their way through a book like that, but very few. So, yes, more feedback from the serial, just because of the nature of the thing. Now that the season is done, people don’t do that anymore. I enjoy the fast pace and energy of the writing. And that I’m freer to dive into side characters and storylines within an episode, not always on the relentless march forward that a novel can require. What are some of the disadvantages of writing serial? They are more difficult to market than novels, mostly because readers are unfamiliar with the form. Serials are the toughest writing I’ve ever loved. And they’re harder to sell than novels, because of reader unfamiliarity with the form and the lack of advertisers who will accept them. But none of that will stop me from tackling Season Two of Debt Collector next year. I enjoy the story, and the pacing, too much. 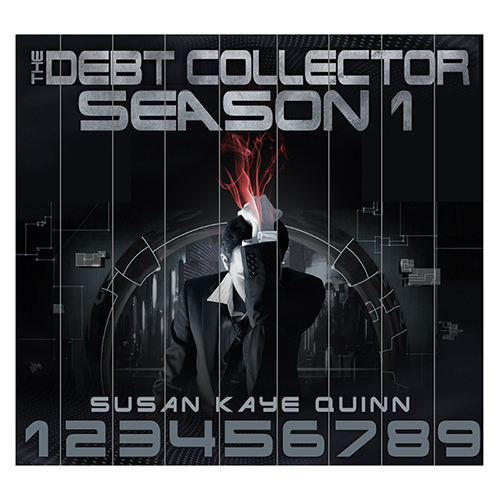 Debt Collector is a haunting and fab story idea. I've loved what I read thus far and look forward to finishing the series. Serial writing is certainly not the current norm, but it nice to see examples of success found by authors using this format. Val – thanks for getting the series! And how cool you're an indie filmmaker! I think a background in screenwriting will definitely help you with fiction writing, especially since it was your first love. Best of luck and keep in touch! Thanks so much for putting this information out there. I actually sat next to RaShelle at a book signing last year and am fascinated by the serial concept. It's nice to hear how the process works from someone who's been there. As a newbie to the Indie world, I'm loving all of this insight. Thank you for being willing to share! You are most welcome! RaShelle is awesome! !